The wedding of your “sapnas” is a perfect composition of 3 essential elements: Style, Decor, and Guest Experience. 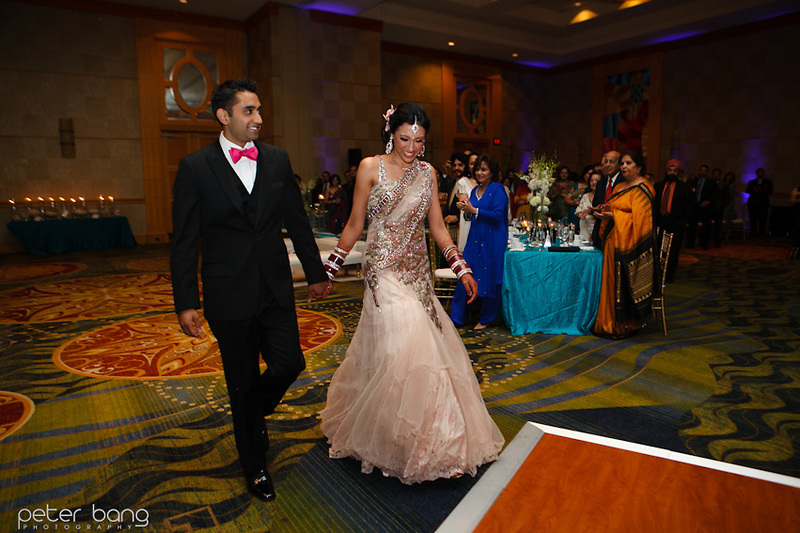 Last September, Yaminee and Navin, celebrated their nuptials with friends and family, in Washington, DC. From designing wedding outfits to keeping the ceremony intimate, read how they composed the wedding of their dreams. Where did you purchase your clothing and jewelry? We purchased all of our clothing and jewelry from boutiques in New Delhi. There is no substitute for hard work in exploration to find the exact look we were going for! What were your must haves for your wedding event looks? 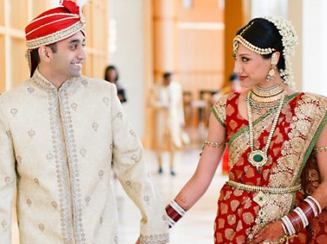 We wanted to blend traditional and modern looks, and pay homage to each of our Indian heritages. Yaminee’s Massi had the wonderful idea of having Navin, who is Tamil, wear North Indian clothes and Yaminee, who is Punjabi, wear South Indian clothes during the ceremony. It couldn’t have turned out better thanks to Yaminee’s hair and make-up artist Suman Khosla and her Assistant, Andy! They did an amazing job in executing our vision. Yaminee’s family did an amazing job and literally designed Yaminee’s wedding outfit from scratch — picking and piecing together elements to make it both unique and consistent with a South Indian bridal look. How many wedding events did you have? We had three wedding events — the Sangeet, Mehndi, and Chura (which was only for immediate family). 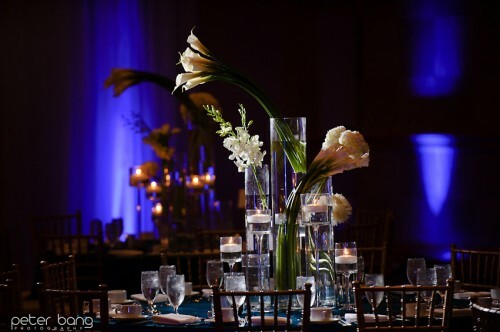 What inspired your event decor for each event? The Sangeet was quite simple. We went with clean centerpieces and classic seating with a colorful backdrop. The wedding and reception were Yaminee’s vision. Though it may sound corny, resources like Pinterest really helped to collect ideas from around the globe and piece them together. We wanted the same overall theme to resonate – simple, elegant, and romantic, with as many white flowers and candles as possible! What was your favorite aspect of your decor? The flowers. Our decor team (Partyland) did a fantastic job in rushing in flowers from from across the globe and arranging them into striking centerpieces and accents, as well as in Yaminee’s braid during the wedding! Our hotel coordinator also was able to give us orchids at the last minute for Yaminee’s hair at the reception, which made the theme that much stronger. Did you do anything special for your guests? We tried to make the whole wedding as intimate as possible. To that end, we had a smaller ceremony where most people could see us on the mandap, and everyone could hear even a tiny whisper. We then had Yaminee’s mom translate the ceremony to the guests in an informal way – which seemed to add to the sense of family to our guests. We also ran a slideshow of childhood, family, and Yaminee and Navin photos for the entirety of the reception. We chose images that reflected our personality rather than our looks, which we think allowed our guests to see through to us a little clearer. What are 3 words your guests would use to describe your wedding events? Intimate: Although there were quite a few guests, we did our best to make sure they knew us. Our speakers at the reception, including our parents, siblings, and best friends, did a great job of that too! Inspiring: We hope our guests fed off of the energy we gave off during the events, including the Baraat, where Navin coaxed even the most unfamiliar to Bhangra along with him!